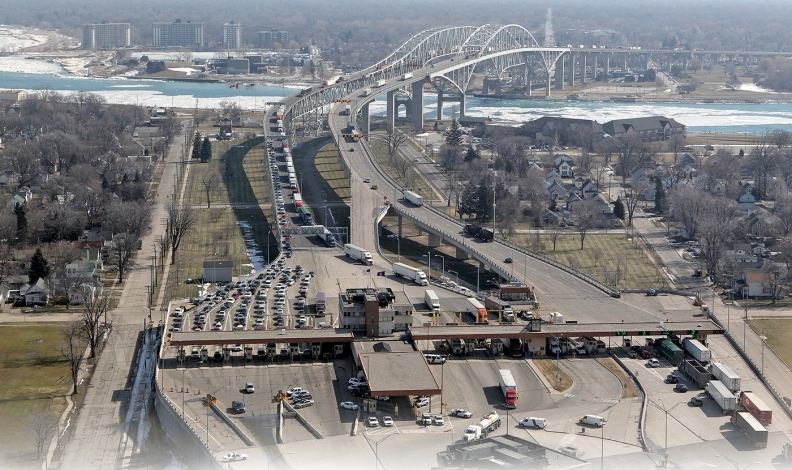 The U.S.-Canadian effort targets easing congestion at border crossings such as the one between Port Huron, Mich., and Sarnia, Ont. WASHINGTON — A renewed U.S.-Canadian effort to speed cross-border trade by pre-inspecting cargo at factories and other sites within the host country could boost productivity in the auto industry. After testing the waters for more than a dozen years, authorities are gearing up to put U.S. Customs and Border Protection officers on Canadian soil to clear shipments there, rather than at U.S. ports of entry — and vice versa for Canadian officers. The effort underscores the two nations' deep-rooted economic relationship and interest in improving customs processes despite current friction over free trade. "This is really positive news because it shows that U.S.-Canada trade-related cooperation has a life outside of NAFTA, that the Trump administration is willing to work on border management and competitiveness in the movement of goods," said Eric Miller, a trade and government relations consultant who heads Rideau Potomac Strategy Group. The U.S. and Canada have the world's largest bilateral trade relationship, having exchanged $582.4 billion in goods and more than $80 billion in services in 2017. Formalizing cargo pre-clearance was discussed during an early February meeting in Washington between Ralph Goodale, Canada's public safety minister, and U.S. Homeland Security Secretary Kirstjen Nielsen. Clearing cargo in advance is meant to relieve pressure on ports of entry where limited space and staffing shortages create congestion during peak traffic periods. But establishing a "reverse inspection" system, in which one country's officials can inspect cargo in the other country, has been complicated by jurisdictional, legal and diplomatic issues. Yet a similar principle has long been at work in commercial air travel, with U.S. officers at several Canadian airports clearing about 12 million passengers a year before they even board a U.S.-bound plane. In 2014, U.S. Customs and Border Protection conducted a five-month trial at the crossing between Blaine, Wash., and Surrey, B.C., to test procedures and technologies for pre-inspecting cargo on trucks. The lessons learned were applied a year later to the much busier Peace Bridge crossing between Buffalo, N.Y., and Fort Erie, Ont. U.S. Customs and Border Protection officers were stationed at the Canadian checkpoint to do primary inspections. 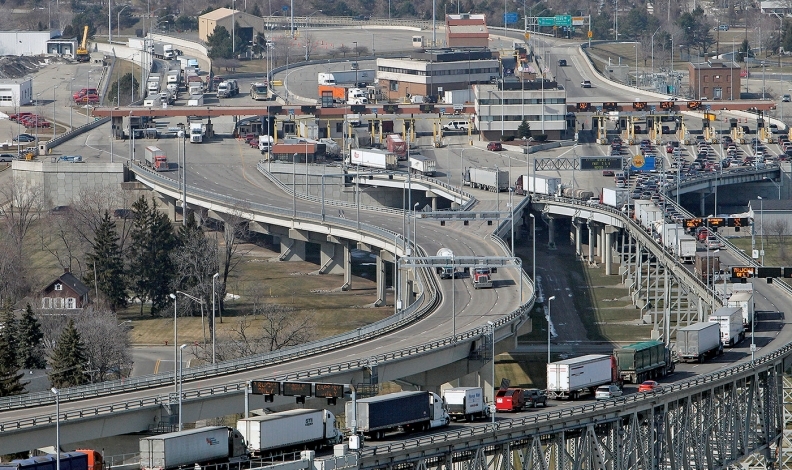 When trucks reached the U.S. side of the bridge, they received a green light or were directed to a cargo lot for secondary inspection. In December, Congress and the Canadian Parliament passed legislation implementing a March 2015 agreement on a legal framework for pre-clearance procedures across transport modes. Officials from both countries will meet this spring to plan regulatory changes needed to introduce more permanent cargo pre-clearance. Canadian officials are pushing to create secure corridors that would allow trucks to bypass normal inspection lanes at border checkpoints. Customs officers or authorized third parties would certify containers and truck trailers as secure before they leave a factory and would equip them with a tamper-proof electronic seal that could be tracked to ensure an unbroken chain of custody, and that they didn't deviate from designated routes. Goodale, in an interview with Politico, said pre-clearance would improve efficiency for the auto industry because intermediate components cross the border multiple times between suppliers and assembly plants. Reducing regulatory burdens at the border has been an industry priority for many years. Three years ago, the Canadian Council of Chief Executives recommended pre-inspecting shipments at factories for high-volume manufacturers that repeatedly ship the same goods. Conducting on-site inspections away from the border would require dedicated inspectors, trained certified contractors and fast lanes at the checkpoint. But the council said companies are willing to pay for personalized customs and cargo security inspections if it results in faster transit times at the border. Participating companies are also likely to belong to U.S. and Canadian trusted-trader programs, which designate shippers as low-risk after their supply chain security controls are vetted. "Auto really is at the forefront of where [Canadian officials] would like to see this go. There are five manufacturers that assemble in Canada, and one of the Detroit 3 would be a candidate for the first test case," said Miller. "It will take huge amounts of unnecessary costs out of the system and has the potential for huge increases in competitiveness." The Canadian Vehicle Manufacturers' Association, Global Automakers of Canada, Automotive Parts Manufacturers' Association in Canada and the Japan Automobile Manufacturers Association say they support pre- clearance, pending more details.